Welcome to the Pinball News In-Depth Review of Chicago Gaming Company’s Medieval Madness Remake. 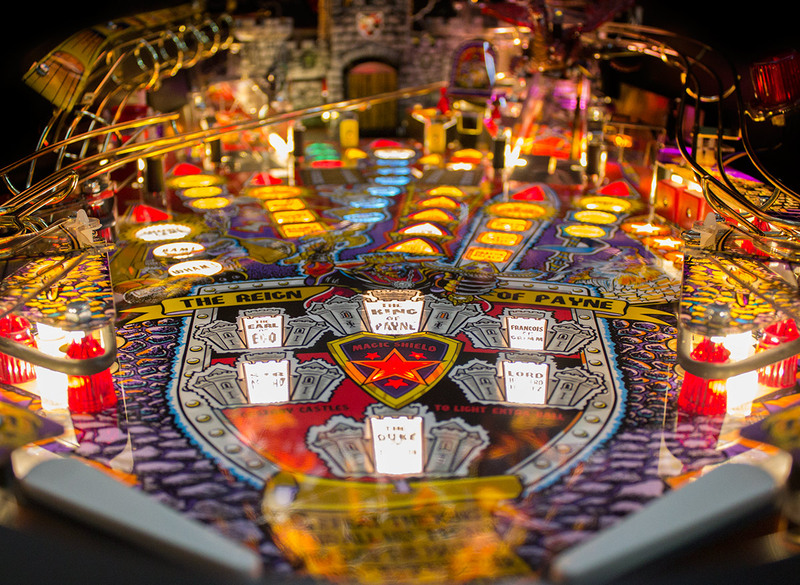 The last time we did an In-Depth Review of a remake was for Retro Pinball’s King of Diamonds. 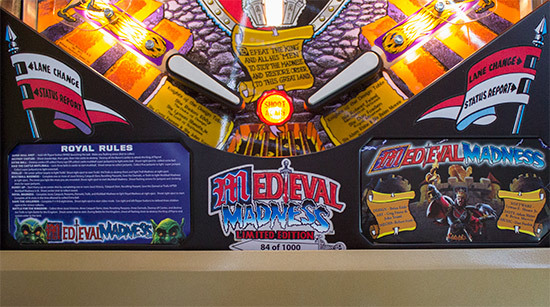 Produced a little over eighteen years after the original, this remake of Medieval Madness hardly compares to the forty-five years between the two Gottlieb machines. 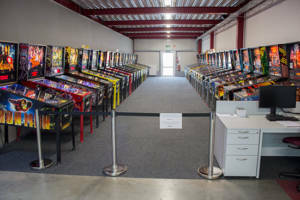 Nevertheless, it’s fascinating to see how technology has advanced in the intervening period, and how faithful a reproduction Chicago Gaming Company have created. 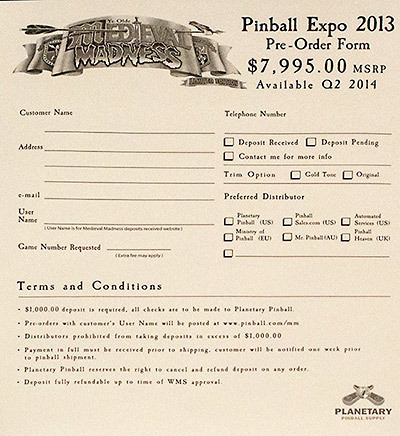 The intention to build a new version of Medieval Madness was announced at Pinball Expo in 2013. 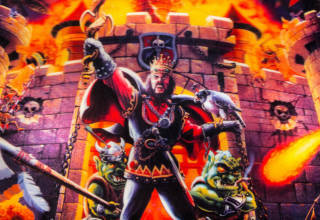 The purchase price was five dollars short of $8,000 – a not inconsiderable sum, but well below the price at which original Medieval Madness games were changing hands at the time. There would be 1,000 Limited Edition models produced, with delivery expected in spring 2014. Those 1,000 LEs sold out in just a few hours, and so a Standard Edition was introduced at the same price but minus a couple of bells and whistles. 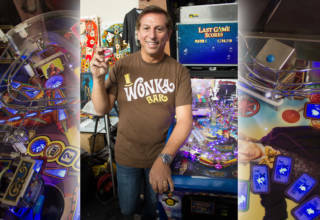 It was also announced that Stern Pinball would be assembling the games, first at their Melrose Park factory, and then at their new Elk Grove Village facility. Jump forward to January 2016 and the first LE machines began to arrive in Europe. 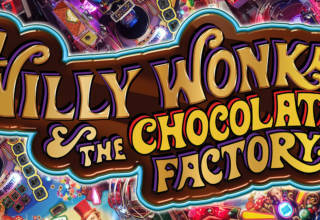 It is one of those that we will be reviewing here. 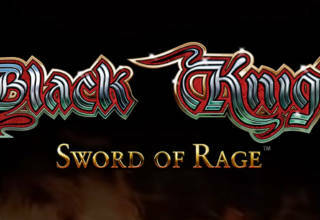 For this review we’re going to assume a familiarity with the original game design, the playfield features, and the overall art package and just look at how this remake differs. All the pictures here are of the new remake, and as with our Game of Thrones review we’ll use the symbol below most of the pictures to denote when you can click on them to see higher-resolution versions. 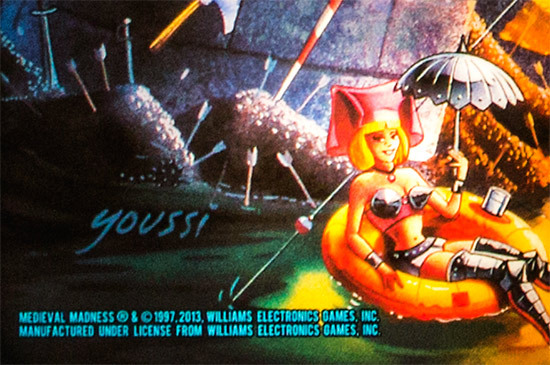 The artwork on the remake is almost identical to the original, with the exception of the Williams logo which has been removed from the translite and cabinet sides, and some new licensing information at the bottom-left of the translite. 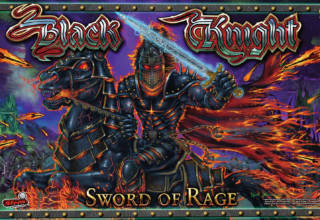 The backbox side art is the same on both sides and unchanged from the original game. The new game uses LEDs instead of incandescent lamps throughout, including in the start button, launch button and coin slots. The start button is especially bright. 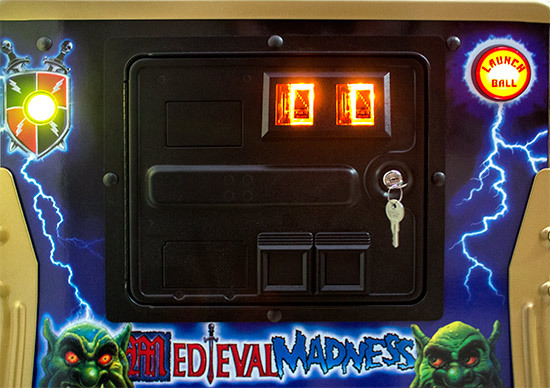 Although this is a game destined for Europe it still comes with an American coin door with the coin slots and cut-outs for a dollar bill acceptor. So far, so similar, but when the remake was ordered the buyer could choose one of three different trim colours for their game. Originally just gold and silver were available, but a black finish was added later. Initial samples of the gold coating turned out more caramel-coloured than gold, but this production version had an attractive metallic matte finish to the lock bar, side rails, legs and leg bolts. The apron comes with custom instruction and information cards pre-installed either side of the Limited Edition numbered decal. 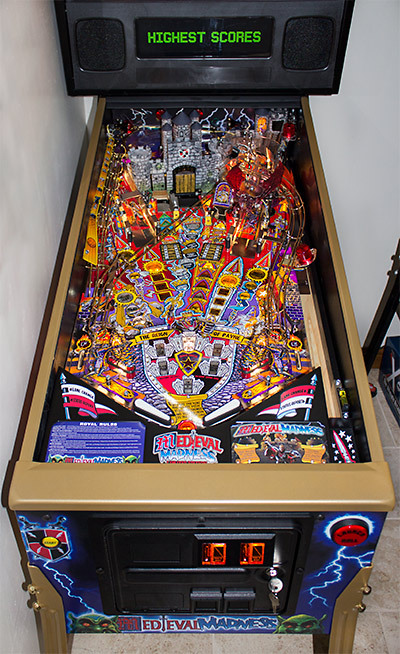 On the playfield, the use of LEDs is the most noticeable change. The playfield is now much more brightly illuminated than before, with a purer white light which manages to maintain some of the warm feel of incandescents without straying into the cold look of cheaper cool white LEDs. The inserts are all suitably bright and evenly lit, with their colour coming from the insert plastic rather than a coloured LED beneath. There are even some impressive fading effects as the LEDs flash on and off to mimic the characteristics of real lamps. 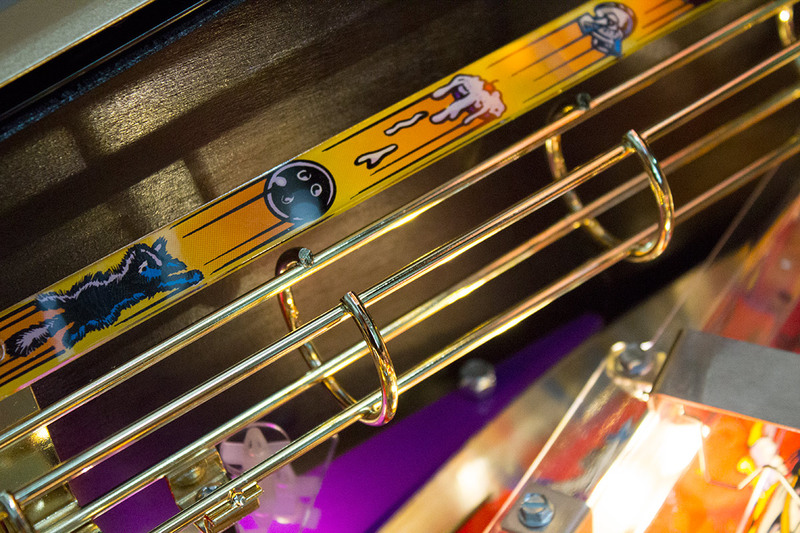 Those inserts are our only point of contention with the whole playfield. While all the artwork is bright and colourful, the printing on the inserts is less convincing. The black lettering appears washed out, as though it needs a second pass of black ink, or a white blocking layer is missing. You can see the difference by comparing the yellow inserts with the blue ones leading up to the Merlin saucer, which do have that white layer. 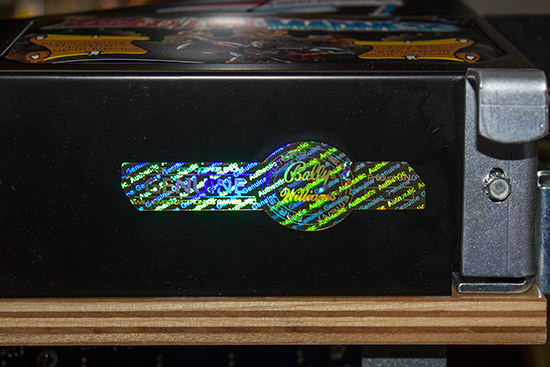 That issue aside, the black line layer appears to be well-aligned with the colour layers – which themselves were free of registration issues – while the clearcoat over the playfield produces an attractive glossy finish. The three wireforms, the flasher holder and the inlane ball guides are all finished in a gold colour to complement the rest of the playfield’s colour scheme. As a package, the playfield is an impressively accurate reproduction of the original game, while being new and free from the effects of eighteen years of play means it looks quite wonderful. 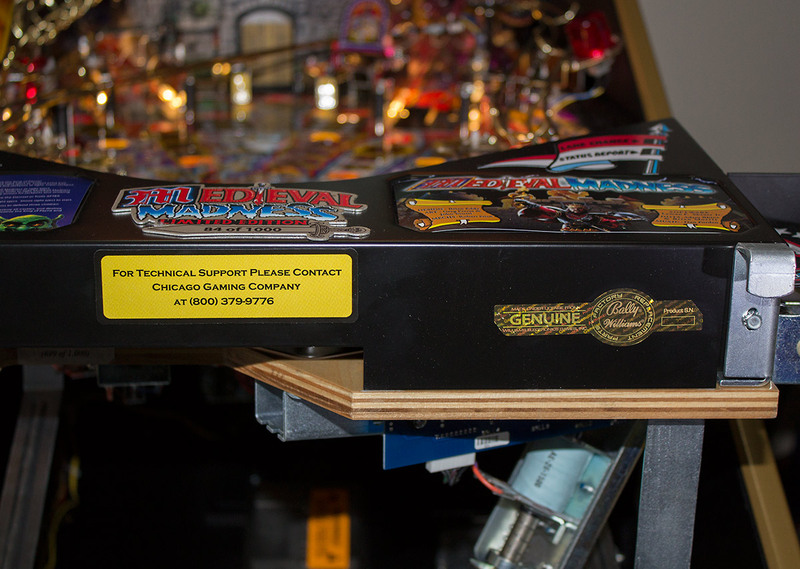 So while the playfield is as true to the original as possible, there are major differences under the plywood, as well as inside the backbox. 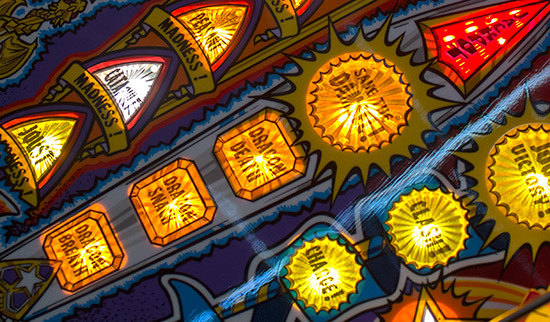 In line with modern pinball manufacturing methods, the mass of wiring usually found under a 1990s pinball has been replaced with bespoke PCBs and localised driver boards. 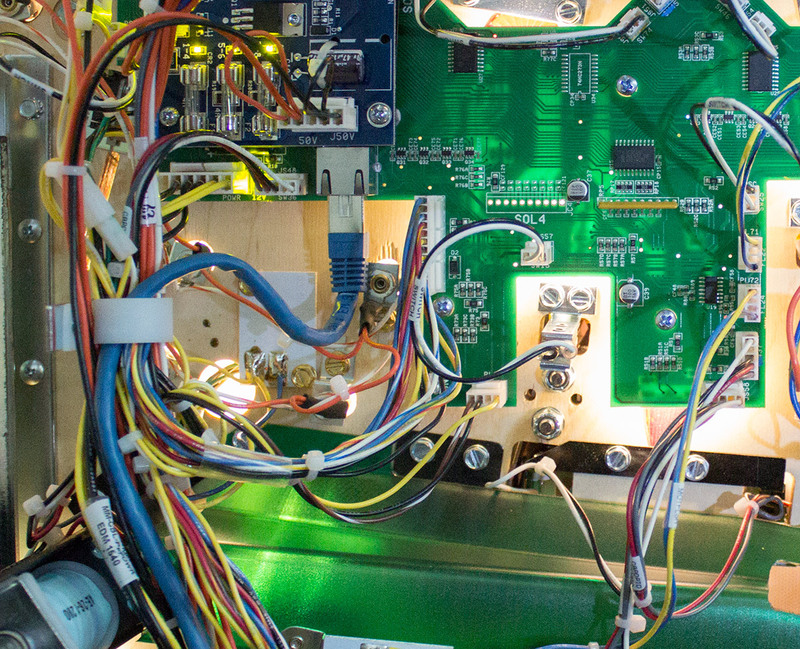 There is one main PCB onto which most of the insert LEDS are mounted. 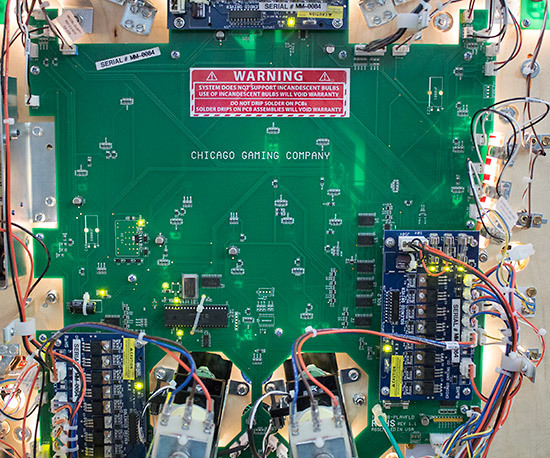 All the LEDs beneath the playfield are white surface mount devices, with the few not covered by the main PCB on satellite boards which plug into the main PCB. 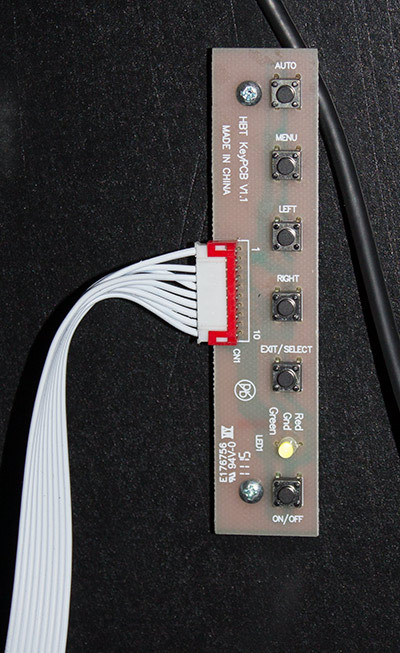 The main PCB only deals with LED outputs and switch inputs. 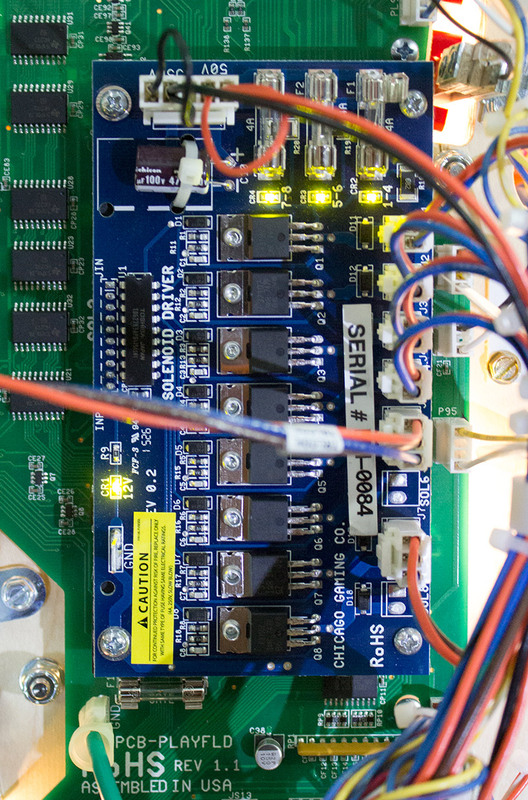 The driving of the high power solenoids is carried out by three identical eight-way driver boards which plug into the main PCB to get their low power and control data. 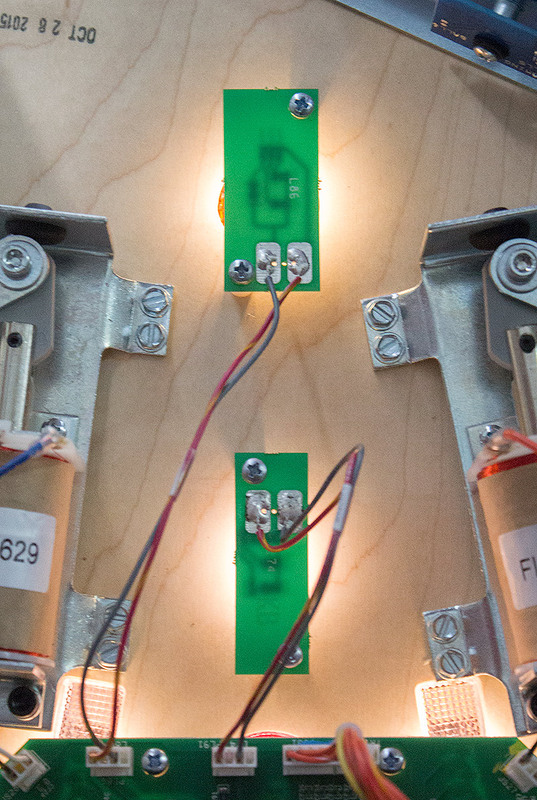 Each board can drive four high-power and four low-power 50V solenoids. 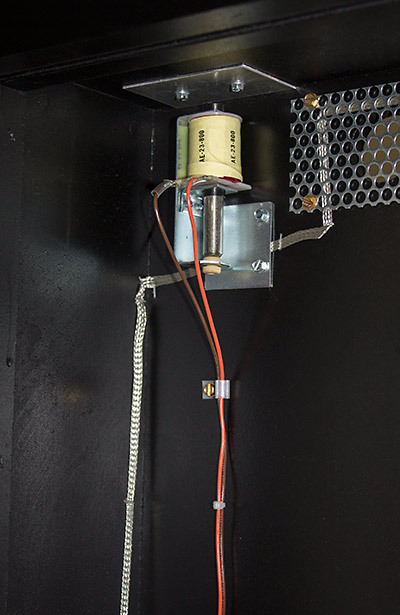 One 4A fuse is used per pair of high-power solenoids, with a third to cover all four low-power coils. 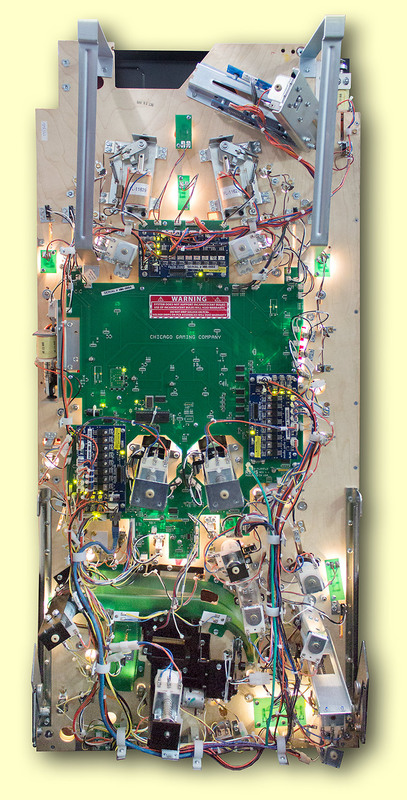 Yellow LEDs show the health of the 50V fuses and the availability of the 12V from the main PCB. 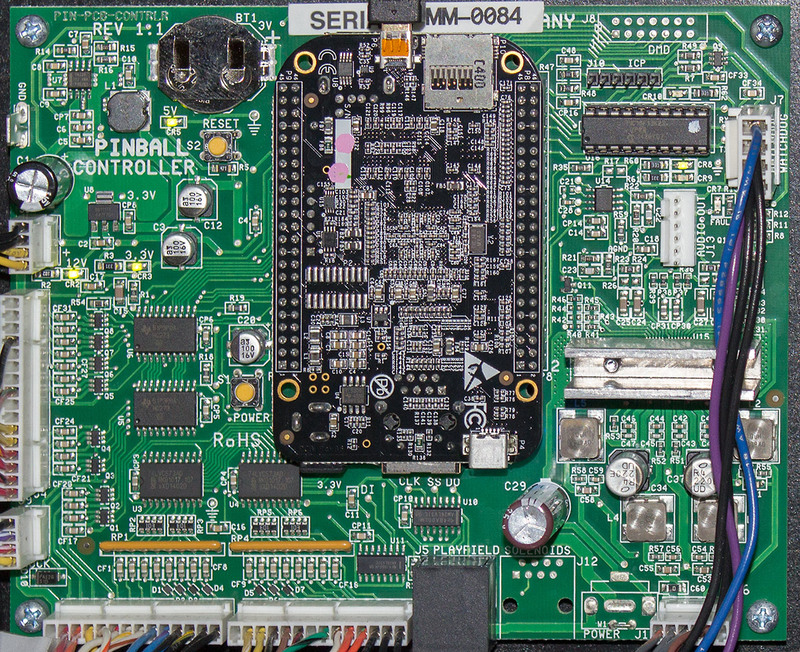 Although there are eight F3710Z MOSFETs on each board, the high-power outputs from devices 6 and 8 are not used in this game and the output header pins are missing from the PCBs. Looking down a little further we come to the cabinet interior which is painted with semi-gloss black. 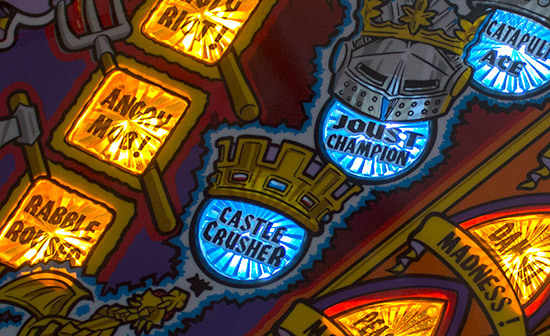 Sitting centre-stage is the game’s shaker motor which is nicely integrated into the game’s rules and produces an effective vibration when the castles are destroyed and at other suitable moments during gameplay. 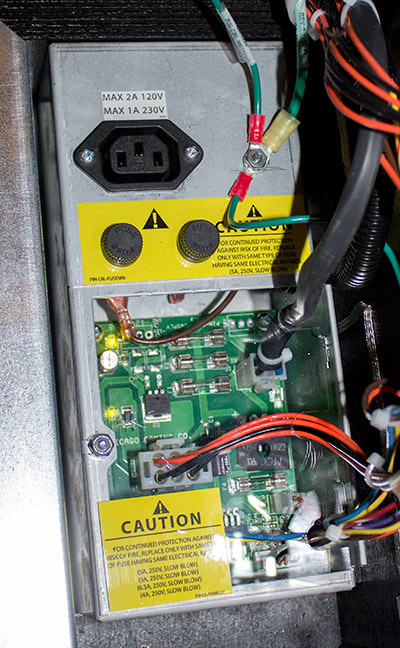 Rather than use a transformer, this remake uses a switching power supply to reduce the mains voltage down to the +/-12V needed by the control system. 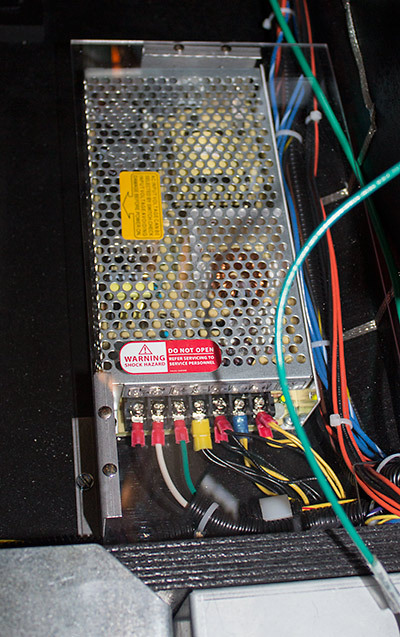 Switching power supplies frequently suffer from overheating, so this one is built into a perforated metal case to allow the heat to escape while protecting the components from stray screws, nuts and other small parts which could fall from the playfield. 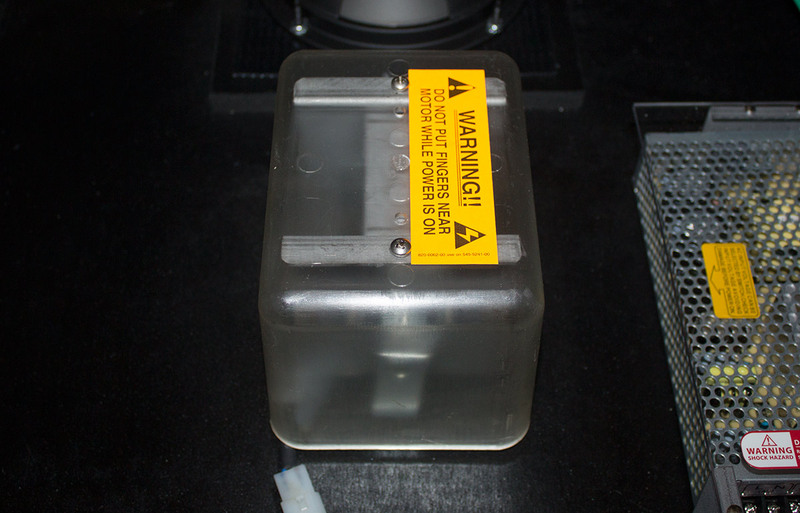 There’s nothing to keep the dust or small metallic particles off it however, and no air flow within the cabinet to aid with cooling when operated in a hot environment. 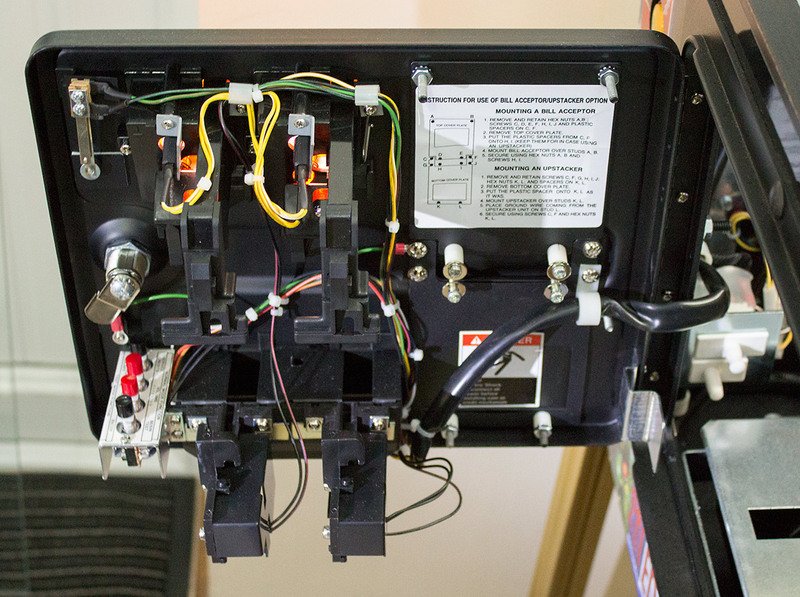 The 50V needed by the solenoids comes from a separate power supply built into the power switch box. This one is covered by a clear, removable plastic window which allows you to at least visually check the state of the four fuses inside. The rest of the cabinet is more conventional, with familiar dual opto boards used for the flipper controls, microswitches for the start and launch buttons, and a classic tilt mechanism. 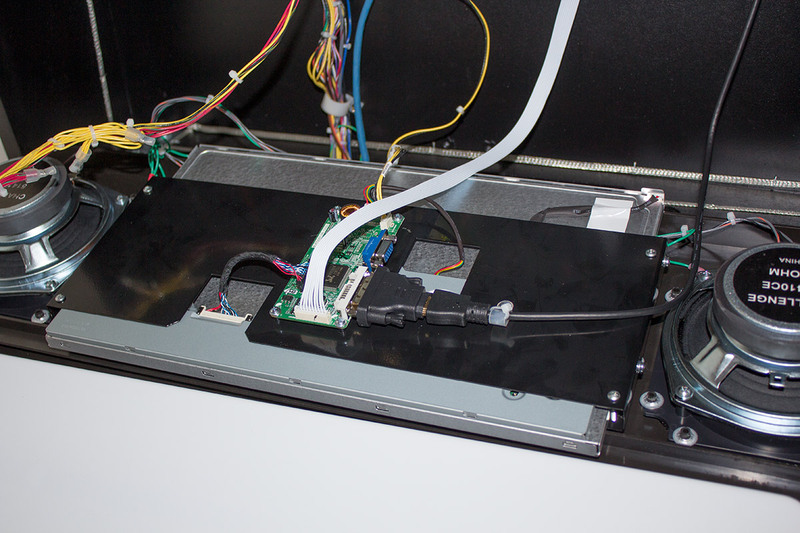 As we saw before, the coin door is a standard US two-slot model with bill acceptor blanking plates but no coin mechs provided as standard. The menu buttons are in the standard Williams configuration with back, down, up and enter buttons from left to right. If the cabinet contents are unconventional, they are nothing compared to the changes found inside the backbox. 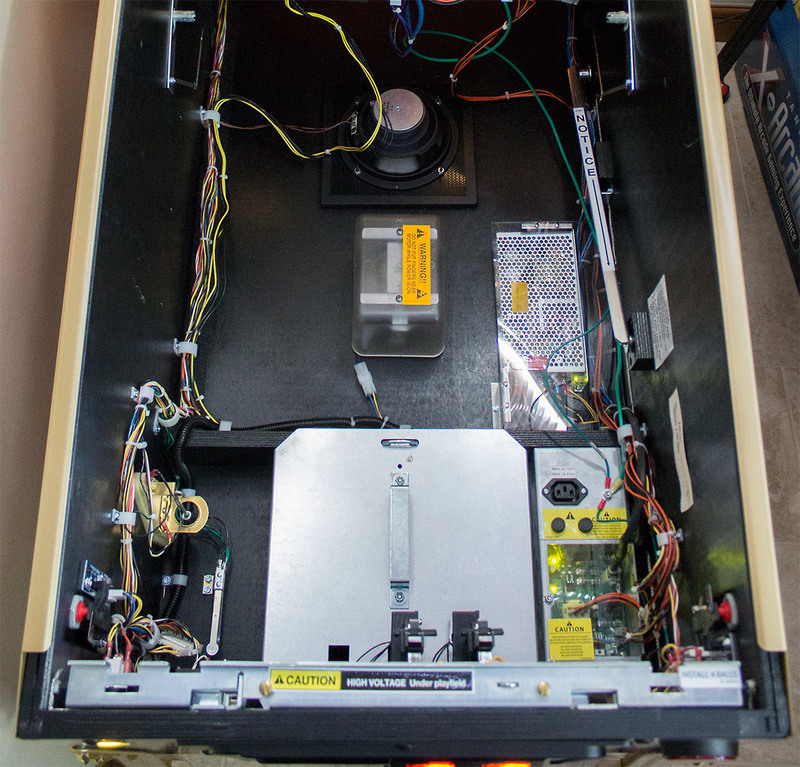 With the driver boards and power supplies under the playfield or in the cabinet, there’s not much left to go behind the translite. 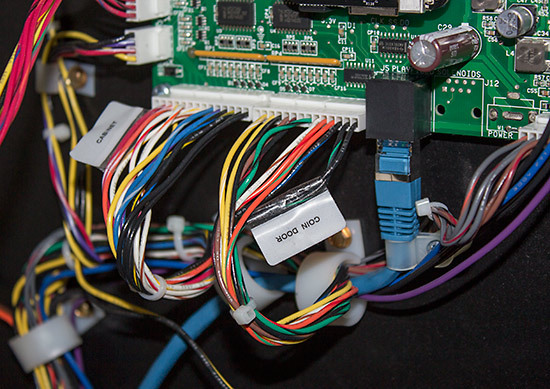 This controller board is about the size of a DVD case and it runs the whole show, from the rules, switch detection and solenoid triggers, to the display, sound and lighting effects. At the heart is a Beaglebone Black single-board computer which plugs into the main controller board to provide the pinball-specific inputs and outputs. 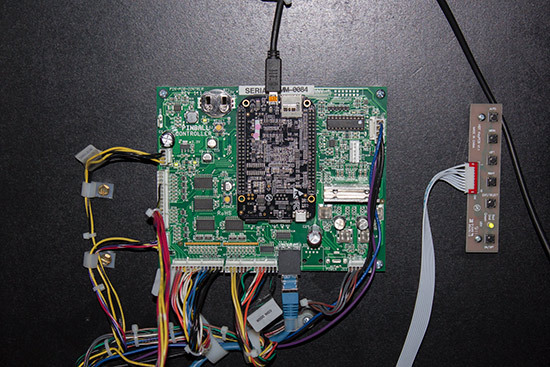 The Beaglebone Black excels at inputs and outputs, having two 48-way headers packed full of them, along with USB, Ethernet and HDMI interfaces. The main PCB beneath the playfield passes data to and from the controller board using a blue Ethernet cable. 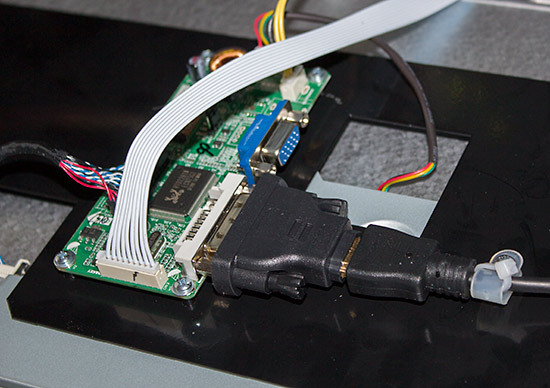 The controller board provides amplification for the audio signal from the Beaglebone Black so it can drive backbox speakers, while the Beaglebone’s own micro-HDMI port is used to drive the display. The display is a full-colour widescreen LCD panel which is slightly larger than necessary for the display window but manages not to extend beyond the dimensions of the speaker panel. 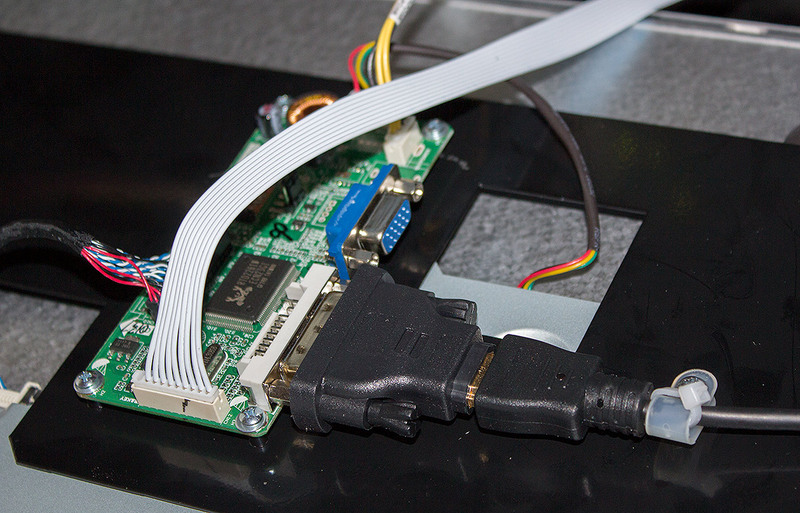 An adaptor makes the HDMI signal suitable for a DVI connection, while a small converter board turns the DVI signal to something suitable for the LCD panel to display. The white ribbon cable leads to a control panel mounted in the backbox which adjusts the display’s own settings independently of the pinball’s menu system. 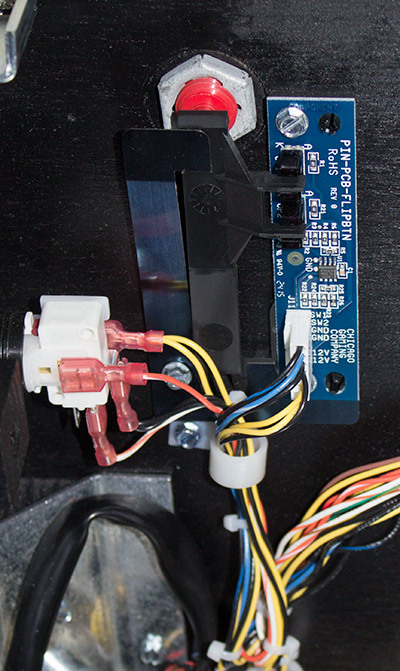 At the time of writing only a user-selectable single colour can be shown on the display, but Chicago Gaming have announced a future upgrade to full-colour with an increased dot resolution. There do appear to be some signal timing issues which can result in ‘tearing’ or flicker on some animations, but these are not fatal flaws and can hopefully be fixed in a future software update. 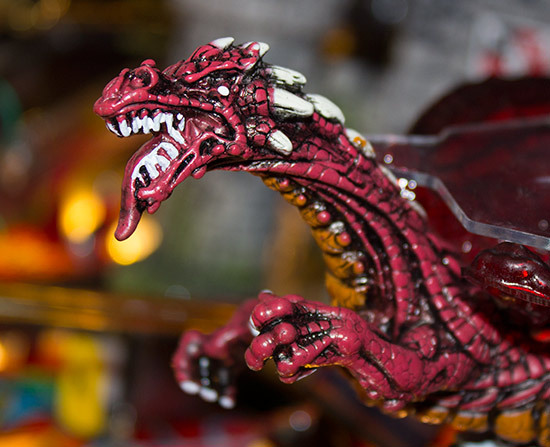 The only other item in the backbox is the game’s knocker, which is a real, physical knocker in the top left corner. With the solenoid drivers under the playfield, a long cable is needed from the knocker to one of these boards. 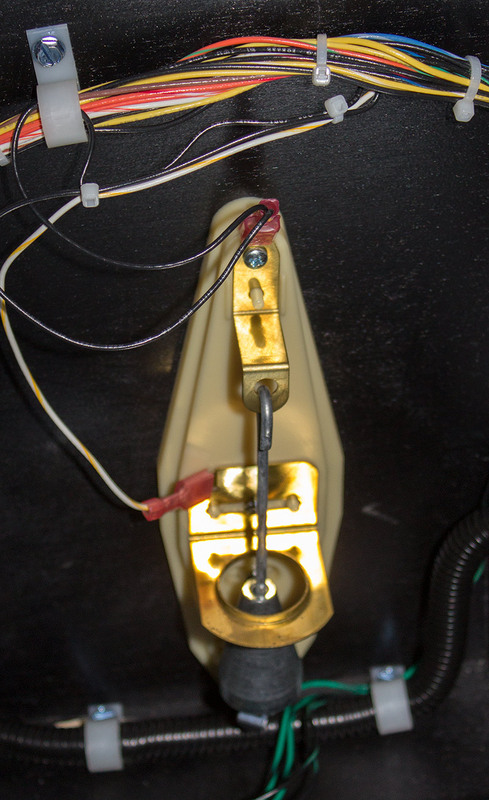 There is a plug and socket half way along the cable which had become tangled and then disconnected during shipping, resulting in the knocker not working. A quick disentanglement and reconnection gave us our ‘thwack’ back. 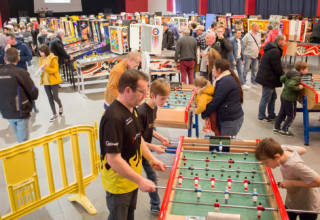 Lighting for the game’s translite is provided in a similar way to the original, with a large white light tray mounted on the back of the backbox glass. The original light tray had multiple holes in it for the many lamp holders which needed to be mounted. 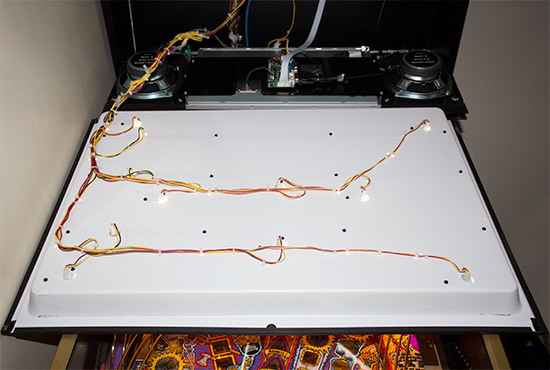 The remake uses LED strips inside the tray which only need one power feed, so the other cables are for the flasher LEDs which highlight certain areas of the translite during specific lighting effects. 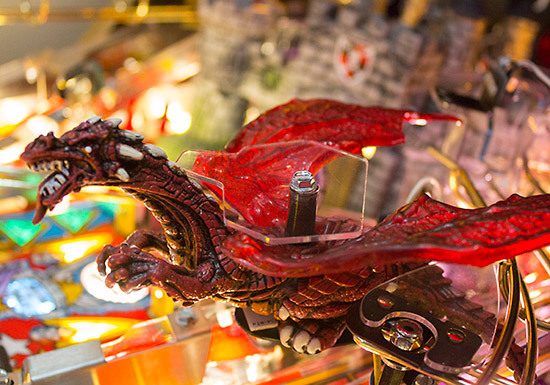 Finally, we return to the playfield to wrap up this In-Depth Review. 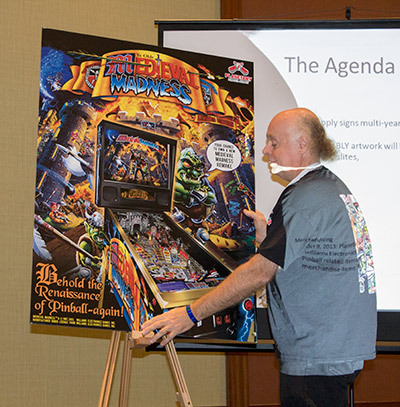 Although the Medieval Madness Remake project was announced by Planetary Pinball Supply and deposits were taken by them, the project was run by Chicago Gaming Company under licence from Williams Electronic Games, as stated on the translite. 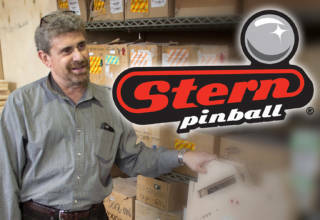 Consequently, Chicago Gaming Company are the ones who worked with Stern Pinball to get the games manufactured and are the ones providing technical support to owners. There is also a hologram sticker from PPS to assure owners this is an officially licensed Bally/Williams product, just in case you had any doubt. 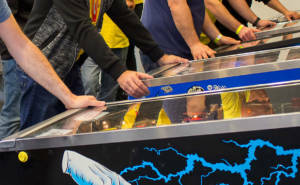 Chicago Gaming Company have done an excellent job of recreating one of the all-time classics, keeping the look and feel of the original while bringing the underlying technology up-to-date, allowing for future enhancements such as re-rendered high-resolution display animations or networked gaming. 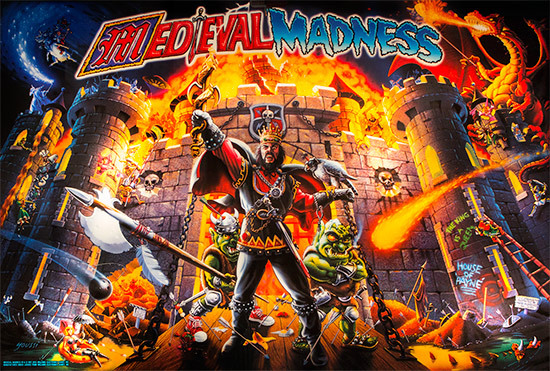 And that brings us to the end of this In-Depth Review of the Medieval Madness Remake. We hope you enjoyed it. Many thanks to John Gilbody for allowing us to use his machine for this article. 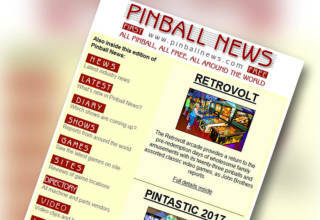 We’ll be back with out next In-Depth Review soon, right here at Pinball News. I am disappointed that this “in depth comparison” does not discuss the most important aspect to the game. Yes the look is important, but GAME PLAY must be the single most important concern. This review does not even broach the subject, much less make the comparison on the feel and accuracy of the game play. I hope this salient aspect is compared in the future.